Media and scientists hyping temperature changes year-to-year so small as to be within the margin of error. 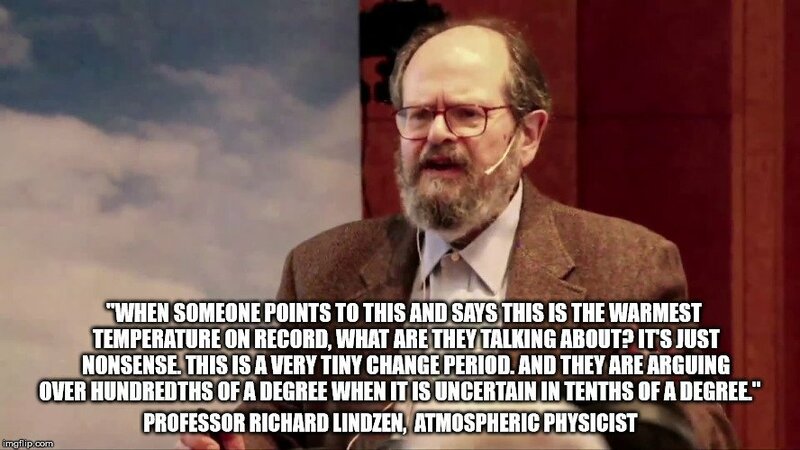 Retired MIT climate scientist Richard Lindzen has ridiculed “hottest year” claims. “The uncertainty here is tenths of a degree. When someone points to this and says this is the warmest temperature on record, what are they talking about? It’s just nonsense. This is a very tiny change period,” Lindzen said. AP’s Seth Borenstein: WASHINGTON (AP) — While 2018 was the fourth-warmest year on record, British meteorologists are predicting the next five years will be much hotter, maybe even record-breaking. Two U.S. agencies, the United Kingdom Met Office and the World Meteorological Organization analyzed global temperatures in slightly different ways, but each came to the same conclusion Wednesday: 2018 was the fourth-warmest year on record behind 2016, 2015 and 2017. The U.S. government’s National Oceanic and Atmospheric Administration said 2018′s average temperature was 58.42 degrees (14.69 Celsius), which is 1.42 degrees (0.79 Celsius) warmer than the 20th century average. Much of Europe had its warmest years on record. Records go back to 1880. NASA and NOAA climate scientists said even though 2018 was a tad cooler than the three previous years that’s mostly due to random weather variations…The U.S. temperature in 2018 was the 14th warmest on average, said NOAA climate monitoring chief Deke Arndt. NASA: Earth’s global surface temperatures in 2018 were the fourth warmest since 1880, according to independent analyses by NASA and the National Oceanic and Atmospheric Administration (NOAA). Global temperatures in 2018 were 1.5 degrees Fahrenheit (0.83 degrees Celsius) warmer than the 1951 to 1980 mean, according to scientists at NASA’s Goddard Institute for Space Studies (GISS) in New York. Globally, 2018’s temperatures rank behind those of 2016, 2017 and 2015. The past five years are, collectively, the warmest years in the modern record. “2018 is yet again an extremely warm year on top of a long-term global warming trend,” said GISS Director Gavin Schmidt. Since the 1880s, the average global surface temperature has risen about 2 degrees Fahrenheit (1 degree Celsius). This warming has been driven in large part by increased emissions into the atmosphere of carbon dioxide and other greenhouse gases caused by human activities, according to Schmidt. These are the same temperature claims made annually, but they lack key components of the temperature history, mostly context. The story also reported that 2014 was the hottest year on record, according to the National Oceanic and Atmospheric Administration and NASA, but did not include the caveat that other recent years had average temperatures that were almost as high—and they all fall within a margin of error that lessens the certainty that any one of the years was the hottest. In Chapter 7, my book deals with “hottest year” claims and their statistical significance. 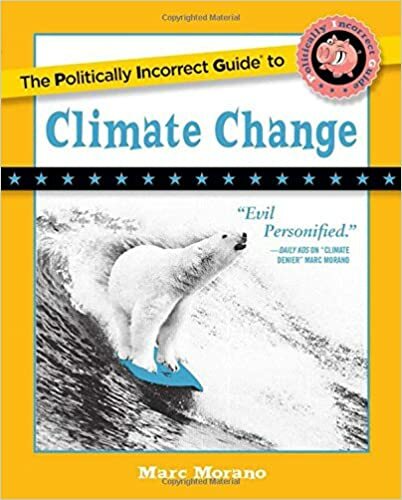 Editor’s Note: The following is an excerpt from author Marc Morano’s new best-selling book, The Politically Incorrect Guide to Climate Change. The New York Times claimed that the 2016 heat “record” was “trouncing” previous years’ temperatures. The Times used phrases like “blown past” to describe the alleged heat record. Curiously, though, the actual numbers for the for the “hottest year” claim did not appear in the Times piece. “When you read a science report claiming that 2016 was the hottest year on record, you might expect that you will get numbers. And you would be wrong,” wrote Robert Tracinski of The Federalist. Why did the New York Times omit the actual temperature data? While such years as 2005, 2010, 2014, and 2015 were declared the hottest years by global warming proponents, a closer examination revealed that the claims were based on year-to-year temperature data that differs by only a few hundredths of a degree to up to a few tenths of a degree—differences that were within the margin of error in the surface data. And the satellite data disagreed with the surface datasets. When an El Niño–fueled 2016 was declared “hottest year,” the temperature rise from 2015 also failed to exceed the margin of error, or exceeded it just barely—depending on which of the multiple temperature datasets were reporting. Physicist Steven E. Koonin, a former Obama administration official, mocked the “hottest year” claims, offering the media what he considered a more accurate way to present the temperature data headlines. “Global Temperatures Up 0.0X for 2016; Within Margin of Error for Last N Years,” Koonin, who served as undersecretary for science in Obama’s Department of Energy, wrote in 2017. In other words, global temperatures are holding basically steady. The media and climate activists are hyping supposed “record” temperatures that are not even outside the margin of error of the dataset as somehow meaningful. It is a fancy way of saying the “pause” or “slowdown,” “hiatus” or “standstill” in temperatures is continuing. did not impress climatologist Judith Curry. “With 2014 essentially tied with 2005 and 2010 for hottest year, this implies that there has been essentially no trend in warming over the past decade. This ‘almost’ record year does not help the growing discrepancy between the climate model projections and the surface temperature observations,” Curry told the Washington Post. But satellite data is also subject to “adjustments.” Tampering with the temperature record has been so widespread that the current climate era has been jokingly called the “Adjustocene” Era. titled, “How They Airbrushed Out the Inconvenient Pause.” “All gone! Vanished into thick air! Just like that! Amazing! Zowee! Look! A quarter of a degree of global warming where there was none before!” Monckton wrote in 2017.
warming of recent decades was not evident in the raw data and has been created by ex-post-facto manipulation of the data—whether for good reasons or bad,” he added. Data from the Environmental Protection Agency agrees with Christy: the EPA website features a 2016 chart labeled “the U.S. Heat Wave Index from 1895 to 2015,” and it reveals that the worst U.S. heatwaves by far happened in the 1930s. “We are creating great anxiety without it being justified . . .there are no indications that the warming is so severe that we need to panic. . . . The warming we have had the last 100 years is so small that if we didn’t have meteorologists and climatologists to measure it we wouldn’t have noticed it at all.” —Lennart Bengtsson, award-winning climate scientist. In my interview with him for my film Climate Hustle, Giegengack said, “I’m impressed by the fact that the present climate, from the perspective of a geologist, is very close to the coldest it’s ever been.” He also said, “The concentration CO2 in the atmosphere today is the close to the lowest it has ever been.” Giegengack has authored two hundred peer-reviewed studies and spent much of his academic career in the doing field research on the history of climate on almost every continent.